For those on the hunt for smooth straight hair, having the best hair dryer can save you hours each week. The best hair dryer for smooth straight hair is definitely going to be one with the newer ionic technology. Most of the ionic blow dryers claim to cut drying time in half. While we didn’t see a 50% decrease in drying time, we did see significant time savings, and smoother straighter hair without additional straightening tools or products. The prices on ionic hair dryers range significantly from a low of $11 to upwards of $300 (some even cost more, but we didn’t even consider those!). We tried many, and found the best hair dryer in the categories of value, travel and overall. BaByliss Pro BABNT5548 2000 Watt Ionic Nano Titanium with Integrated Ion Generator Hair Dryer. After reading many reviews comparing this to the Harry Josh Pro Tools Dyer 2000, we had to try it out. For less than 1/3 of the price, it was worth a shot, and we lucked out as the normal $120 price was on sale for only $60. What we were surprised most about with this little beauty was the size – it’s large enough to do the job and small enough to travel with you. It does weigh in a bit more than the average hair dryer, but we’ve read that’s due to the motor, which allows you to switch from hot to cool instantly, and is supposed to outlast an average hair dryer. When we timed the drying efficiency we did see two things – faster drying time and smoother hair. 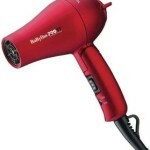 Value: Best Hair Dryer – Updated! Revlon 1875W Infrared Hair Dryer. 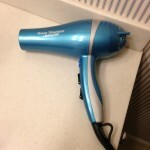 For those with shoulder length hair or sho rter, this is a great quick hair dryer. It’s also very reasonably priced for the time saved versus a regular non ionic dryer. We found this Revlon hair dryer for under $20. If you’re on a budget or just want something decent that works well and doesn’t require much of an investment, this may be the best hair dryer to get you that smooth straight hair. BaByliss. This hair dryer made by well-known brand BaByliss packs well, is light, and will work better than most hotel dryers by far. Also very reasonably priced at $30 or so, this may be the best hair dryer option for you if you’re in need of a travel dryer that packs well, works well and is well priced. In summary, we found these to be the best hair dryers for smooth straight hair. All three did the job well enough, but have positives and negatives. So what are we using now? We have the BaByliss Pro BABNT558 2000 Watt Ionic Nano Titanium as the daily work horse, the Revlon Hair Dryer as the back up (also used for the kids a few times a week), and the BaByliss Travel dryer as the travel hair dryer. Looking for more hair tips? Find out the Best Dry Shampoo out there!